Swallowed air, which usually happens during feeding. The normal breakdown of digested food. 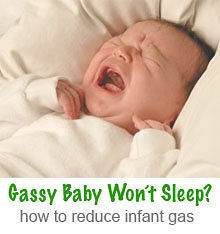 If your baby fusses briefly and you suspect gas, it’s probably not something to worry about. There will be gas, and it’s not always preventable. 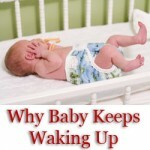 You should be concerned, however, if the discomfort is persistent or if the gas causes baby sleep problems. If that happens, here are some strategies you can use to help your gassy baby. These are steps that you, as a parent or caretaker, can take to help reduce the amount of gas your baby gets (or keeps) in his or her tummy. Much of the gas your baby ingests is during feeding, especially bottle-feeding. There are many product lines designed to address this specific problem; perhaps the most famous of these is the Dr. Brown’s bottle, which (although expensive and a bit tedious to wash all the pieces) has a unique design, backed by numerous patents, for reducing the amount of air that your baby gets while drinking. One falsehood about feeding infants that we quickly disavowed was the tradition of feeding the baby a bottle in entirety, and then burping. You see enough spit-ups, and you start to appreciate the fact that babies need burping regularly during feeding. We started pausing 1/3 or 1/2 of the way through the bottle — or if the little guy suddenly slowed down — to try and get a burp. Different burping positions, like sitting up or the football hold. Playing “bicycle” with baby’s legs (while she’s on her back). Holding the baby upright (and securely) and walking up and down stairs. Get that burp out any way you can! Sometimes you might take a break of 10-15 minutes, let the baby play or rest, and then try again. You’d be surprised how often this works! See also our article on how to burp a baby. Putting your infant on his or her belly (tummy time) is a bit of a gamble in the first few months, as this can encourage spit-ups. After 3 months, however, your pediatrician may encourage you to spend some “tummy time” each day where your baby practices pushing up while laying prone. It’s good strength training and an opportunity to get a burp out, as the pressure on the abdomen can be very helpful. A boppy pillow is useful to provide a soft place and give your little one some extra leverage. If your baby struggles with gas and/or reflux as ours did, there are some other options. “Treatments” is probably too strong of a word for these; they’re more like supplements that may or may not provide some relief. We have experience with two of the most widely used ones, and so will mention them here. Gas relief drops such as Mylicon contain simethicone, which our pediatrician described as a kind of soap that helps bubbles merge together so you can burp them out. You should ask your pediatrician and follow the directions. You should also be aware that your baby might not like the taste or smell of this stuff. Mixing it into half a bottle of milk seems to help mask the taste. Gripe water is an herbal product that a number of parents swear by. I have to admit that our extra-fussy twin boy did seem far more mellow after eating when we gave him some of this. There’s undoubtedly a soothing effect and I believe the ingredients are all natural. The only down side is that this stuff can be a tad expensive, so order it online or look for it on sale. If you’re supplementing or feeding exclusively with infant formula, there are a couple of options to consider. 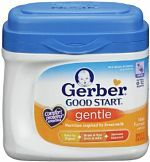 Most of the big formula-makers now offer a “gentle” version of their product, which purports to reduce digestive discomfort and/or fussiness. We switched to this for our twins and it did seem to help. A note of caution: the main ingredient of standard infant formula is powdered milk, but the main ingredient of most “gentle” formula is often high fructose corn syrup. This might not be a huge deal, as infants do need a lot of calories. But once our boys grew out of their reflux/spit-ups, we switched back to regular formula. It just seemed like a good idea, as there’s plenty of high-fructose corn syrup in store for children later in life. There are some alternative infant formula products, such as soy-based formula, that might help your little one as well. Get a little canister to start, and if they like it, buy big! Of course, you should run this by the pediatrician first. 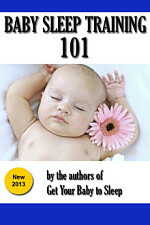 Baby Sleep Training 101 is our definitive guide to establishing healthy baby sleep habits and teaching your baby to sleep through the night. 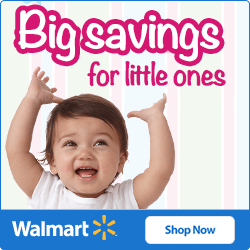 Baby Won't Sleep • Handling Setbacks Teething Baby • Sick Baby • Got Gas?